JJC GSP Series Glass Protector is a sheet of 0.01" ultra-thin optical glass used to protect your camera's LCD screen. 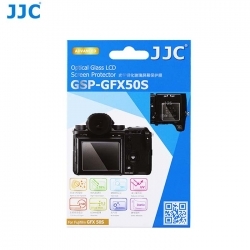 The 95% high transmittance helps the clear image display on LCD screen. The surface hardness rating of 9 H and multiple layers of protective material shield your screen from dirt, scratches, sweat, smears and light impact. The shatter-proof glass blocks UV rays while allowing visible light in. The protector surface is also resistant to water, oil and fingerprints. 2.5D round edges provides a very comfortable and smooth surface to grip and prevent the edges from scratching fingers during installation. The glass protector is easy to install without trapping any air bubbles, and is just as simple to remove. The static adhesion method leaves no sticky residue behind your screen. The package contains cleaning tools such as wet wipe, microfiber cloth and dust-absorber for your easy cleaning. The protector also gifts you a pair of PET guard film for camera sub-screen, subject to specific camera model.